Iraklii and I are chatting in a former Soviet garment factory in Tbilisi, a beloved haunt of local hipsters and tourists. By the looks of it, the security of this modish establishment, which now comprises several bars, cafés, coworking spaces and a hostel, turns a blind eye to the goings-on in the toilets, ensuring its place in the good books of the young people who fill it to the brim every evening. On 5 March, the Georgian parliament once again postponed consideration of an amendments package aimed at improving “drug policy legislation”. Deputies are expected to take a more liberal approach to this issue. The need for change stems from the decriminalisation of the personal use of marijuana by Georgia’s Constitutional Court in November 2017. The court made the ruling following relentless pressure from Georgia’s libertarian Girchi party and the White Noise activist movement. Having joined forces, Girchi and White Noise were able to cement public opinion around the idea that the country’s current drug policy is repressive. That the issue impinges on the lives of thousands of young people has been amply demonstrated by regular protests demanding a review of the legislation. The most recent large-scale demonstration took place in December 2017. 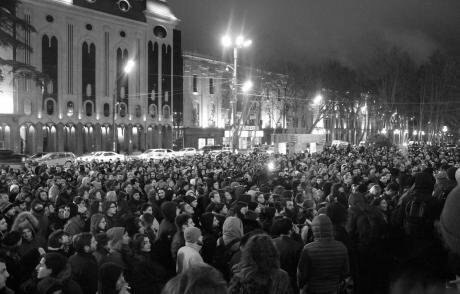 In addition to rallies in Tbilisi, people took to the streets in Georgia’s other major cities – Batumi, Kutaisi and Zugdidi. To get a sense of the acuteness of Georgia’s drugs problem, we need only take a look at official data released by the UN Office on Drugs and Crime: in 2017, Georgia was ranked third among 101 countries where two percent of the 16-64 population use hard drugs. Official statistics on the use of soft drugs in Georgia do not exist. Unspoken decriminalisation is one of the reasons why the former garment factory I visited above has become so widely popular. Girchi leader Zurab Japaridze is convinced that this sort of business model will become the key to the future economic success of the former Soviet republic. Zurab Japaridze.The New Political Center–Girchi party was founded in 2015 by a group of politicians who quit the ranks of United National Movement, the former ruling party of ex-president Mikheil Saakashvili. Girchi supporters espouse ultra-liberal views. In addition to drug legalisation, Girchi advocates the abolition of compulsory military service and minimal government intervention in the economy. If the government plucked up the courage and legalised soft drugs, Japaridze believes, the Georgian economy would double in size. He argues, furthermore, that decriminalisation would attract floods of tourists to the country, creating 70,000 new jobs and catalysing the development of new infrastructure including hotels and hostels. Japaridze and Girchi are not alone in their advocacy of a humane drug policy. The White Noise movement has been actively campaigning for decriminalisation for four years, but, emboldened by the Constitutional Court’s ruling, its supporters now want to achieve full legalisation. 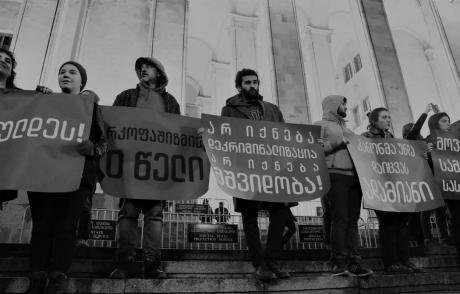 The movement comprises Georgian progressives: musicians, writers, artists, students with an active civic stance, and so on. In 2016, 33 non-governmental organisations joined forces to found Georgia’s National Drug Policy Platform, with White Noise playing a leading role in the process. Later, in April 2017, representatives from the movement appealed to parliament with a legislative initiative to reform the country’s drug policy, its main objectives including the decriminalisation of all drug consumption and the regulation of the process of screening citizens for substance intoxication. Human rights activists believe that the police abuse screening procedures and exploit them as a means of intimidating citizens. All the players in the reform process, including the leadership of Georgia’s Ministry of Internal Affairs, agree with this assessment. The campaign’s supporters are also demanding that an unambiguous legal distinction is made between users and dealers. But the most crucial issue of all, in the eyes of the activist, is that of compulsory medical treatment – something he says is being discussed at a serious level. “What if I don’t consider myself sick?” he asks. The drug policy question has divided the Georgian public. Some demand full legalisation while others, conversely, speak out in favour of uncompromising prohibition and compulsory treatment of drug addicts. Between these two opposing camps stands Akaki Zoidze, chair of the Georgian parliament’s Health Care and Social Issues Committee; the onus is on him to devise a law that would satisfy all sides. 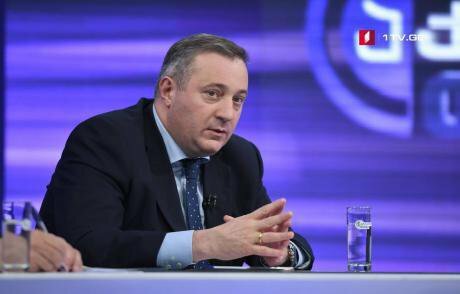 Akaki Zoidze.Nevertheless, Zoidze supports the National Platform in stressing that it is first and foremost imperative to differentiate between drug dealers and their victims. Precisely therein, he believes, lies the solution to the problem. Zoidze is also of the opinion that existing drug trade suppression strategies are ineffective. After all, it is users rather than dealers who languish in Georgian prisons. The state has pledged to use the new legislation to attend to addicts’ needs rather than to punish them. Social reintegration will be promoted in accordance with the Portuguese model, with plans for the creation of addict assistance commissions currently underway. In contrast to Portugal, however, the Georgian commissions will include clerics instead of lawyers. Those most likely to be entrusted with the reintegration of “prodigal children” make no bones about their approach to the problem. The Georgian Orthodox Church has adopted an unyielding stance, refusing so much as to entertain the prospect of legalisation. Catholicos-Patriarch of All Georgia Ilia II has affirmed that, given the country’s demographic crisis, it is essential to proceed with particular circumspection and choose a multidimensional approach. The patriarch has also called for the construction of rehabilitation centres and for the inculcation of negative public views, especially among young people, towards this “grave affliction”. January 26: protest action “All for one”.Girchi activists, meanwhile, are convinced that deputies suspended work on the bill under pressure from the Patriarchate. Girchi leader Zurab Japaridze isn’t ruling out the possibility that certain senior members of the ruling Georgian Dream party may simply yield to the clergy’s desire to make their own amendments to the bill – and all the more so because both the president and the chair of the Georgian parliament came out in support of the church’s statement. Getting high is virtually the sole source of fun for villagers and small-town residents who subsist without work and have no prospects for the future. Despite prohibition, many people cultivate cannabis at home. And the regions are competing for the “best variety” title. The police have exploited this fact for blackmail purposes over the course of many years. The case of Demur Sturua, for instance, remains unsolved even today. 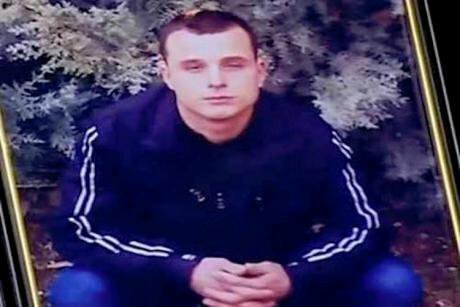 In August 2016, Sturua, a 22-year-old resident of the Samtredia district in west Georgia, took his own life after penning a farewell letter to his mother. Sturua wrote in the letter that he had been pressured into collaboration by a police officer who’d threatened to put him behind bars for growing marijuana if he failed to do so. A casualty of Georgia’s punitive drugs policy: 22-year old Demur Sturua from Samtredia, western Georgia. Image still via Maestro TV / Youtube. Some rights reserved.Last year, the arrest of two rappers from the Birja Mafia group precipitated thousands of spontaneous protest rallies. The rappers were arrested for possession of drugs. As it turned out later, however, the real cause of the law enforcers’ wrath was a music video featuring a cop in a dog collar: the drugs had simply been planted on the musicians. In the end, Birja Mafia got seriously lucky: the Georgian rapper Bera, son of former Georgian Prime Minister and Georgian Dream leader Bidzina Ivanishvili, intervened in their case, prompting the court to release them on bail. Revealing, too, is the case of actor Georgi Giorganashvili, also known as Bakhala. On 28 January, Giorganashvili was sentenced to a minimum of eight years’ imprisonment by Tbilisi City Court. The actor was found guilty of acquiring and possessing particularly large quantities of narcotic substances – namely, 0.3726 grams of buprenorphine ("subutex"). The defendant, one of the most popular Georgian actors of modern times, insists he’s innocent, claiming that, once again, the drugs were planted on him by police. Various public figures and NGOs have penned an open letter to the authorities, demanding that Bakhala be released. The frenzied nature of the debates around the drug policy question means that measured voices are often drowned out. 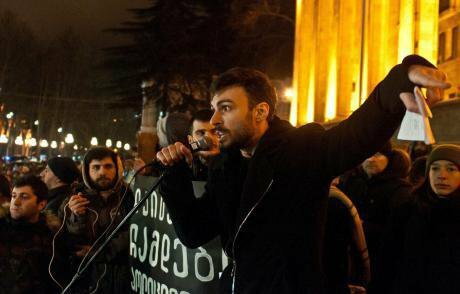 But the work of singer Erekle Deisadze, a White Noise activist, has really got people speaking out (and dancing) in defence of their truth. In a track called “Khalkuri”, Deisadze takes the motifs of leading Georgian composer Giya Kancheli and gives them an electronic makeover while chanting the praises of “drugs and psychedelia”. The accompanying music video, which appeared on YouTube six weeks ago, has received over 600,000 views – not bad by the standards of Georgian internet. That said, local radio stations still haven’t ventured to give the track any airplay. The vast majority of experts surveyed on the matter agree that the state machine, powerless to implement effective prevention strategies, finds it more straightforward simply to punish drug users. But in the minds of majority, Georgia is the birthplace of winemaking, and Georgians are capable of making high-flown toasts at the dinner table for whole days on end. For many decades, the ability to down glass after glass of red wine was regarded in these parts as a man’s greatest selling point. As the years have gone by, though, Georgia’s dinner-table traditions – and the cult of the tamara – have begun to die away. For Georgians, the topic of drug decriminalisation has become a kind of litmus test. 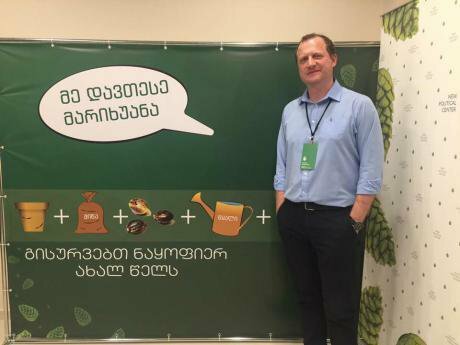 It would appear that traditionally-minded strata of Georgian society are not yet ready to make the switch from wine to marijuana.